France is recalling its ambassador to Italy over so-called “outrageous” attacks on the French government by Italy's leaders, further weakening a European Union struggling with Brexit and other divisions. France's Foreign Ministry said its ambassador to Rome is being brought back for “consultations,” after what it said were “repeated and baseless attacks and outrageous statements” by the Italian government, which it suggested were aimed at winning win votes in May's European parliament elections. Italy's Deputy Prime Minister Luigi di Maio met Wednesday with French yellow vest protesters — and after mounting tensions between Rome and Paris over issues ranging from immigration to the Libyan crisis. France's European affairs minister, Nathalie Loiseau, later tried to dial down tensions. 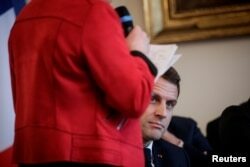 In remarks carried on French radio, she called for restarting political dialogue. While Paris and Rome do not share the same political choices, she said, both governments must focus on domestic issues their citizens care about. Italian leaders have directed sharp criticism against French President Emmanuel Macron and his government in recent months. Di Maio has accused France of continuing to colonize Africa and of fueling the migrant crisis. Italian Interior Minister Matteo Salvini described Macron as a “terrible president” and said he hoped French voters would turn against him. France and Italy also are competing for influence in trying to solve the Libyan crisis. The last straw for France came with di Maio's meeting with French yellow vests who plan to run in elections. After the meeting, he tweeted that the “wind of change has crossed the Alps” into France. The spat adds to EU worries that include a potentially chaotic hard-Brexit and divisions among other European governments that include rising populist movements. Defarges said that is why this particular spat between Paris and Rome is so worrying. Defarges also said Italy's anger over immigration has some merit. Along with Greece, it is shouldering the biggest burden of migrants crossing the Mediterranean, while France and other European nations are not taking on their fair share.